Mr. Mugabi Tonny 30 years old with cerebral palsy and married with two girls in Ssanga-Wakiso district. He depends on agriculture as only source of income for the family. Tonny has lived with cerebral palsy since childhood 1987. He attended his both primary level and O-level at Masindi Centre school for Handicapped and completed in 2000. Tonny succeeded his life with the help of grandmother who was taking care for him before she died. 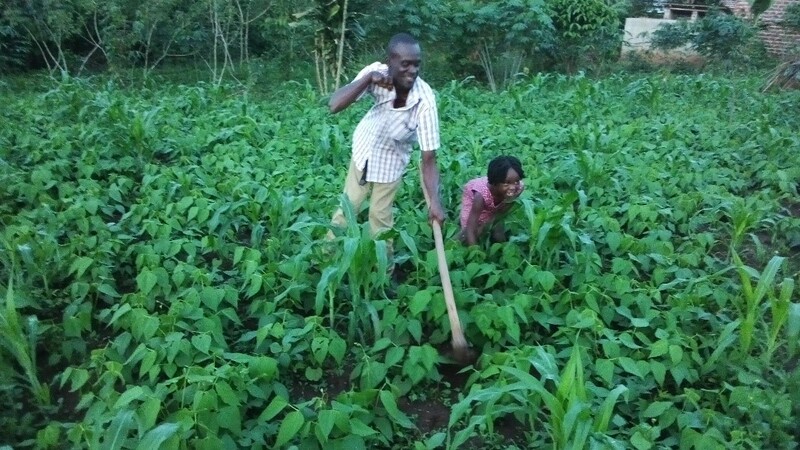 His family depends on agriculture produces that contributed much to the family needs like this season expects to harvest 2 bags of maize and 1 bags of beans. “I thank UNAC for empowering me to become who I am and also being there for me all times whenever I have a challenge in my life”. Says Tonny. He only lacks money to buy Agro-chemicals and fertilizers for his gardens. In five years, Tonny plans to start a poultry project and Goat raring at his small piece of land to increase income for the family.